The long running animated series The Simpsons always celebrates Halloween with a new anthology episode of spooky short stories, and the first details for this year’s Treehouse of Horror XXIX have just been revealed, as well as a sweet teaser poster. This year’s 29th annual Treehouse of Horror episode will include spoofs of Jurassic Park/World, Invasion of the Body Snatchers, and The Three Faces of Eve, as H.P. Lovecraft’s mythical creature Cthulhu will also be appearing and is featured prominently on the poster, which Fox will be passing out at next week’s San Diego Comic Con (SDCC). Treehouse of Horror XXIX was written by Joel H. Cohen and directed by Matthew Faughnan, and is part of The Simpsons‘ landmark 30th season. Premiering in October, there is no confirmed airdate yet, but we will update this post when it is announced. Here’s the official logline for the Halloween special: Homer wins an oyster-eating contest against the mythical Cthulhu. Springfield is overrun by plant body-snatchers, Lisa finally snaps, and Mr. Burns opens a retirement home with some Jurassic upgrades (Geriatric World). 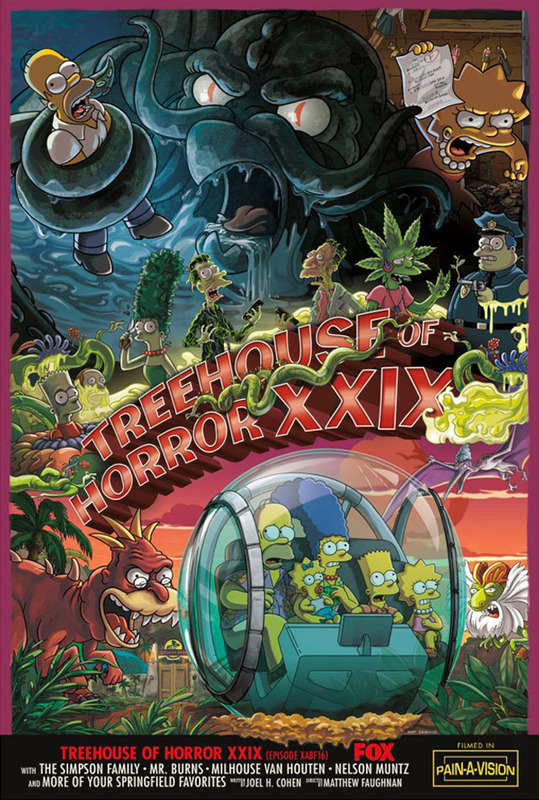 You can check out the SDCC poster for The Simpsons Treehouse of Horror XXIX below.